The Sense energy monitor is the best in the business when it comes to automatic appliance detection and monitoring. It uses machine learning and a sensor that measures your electricity millions of times per second. Do you want to know exactly how much your 10 year old drier is costing you to run? Maybe you want to know what time your kids finally switched the TV off and went to bed. The Sense energy monitor may just be the ticket. 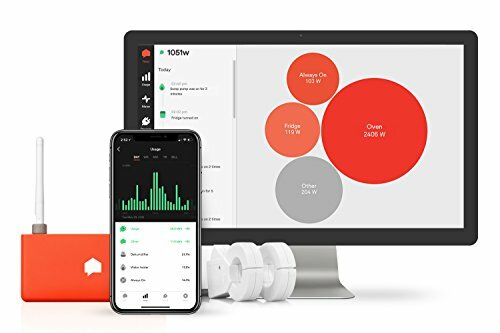 While the Sense performs wonderfully as a whole home energy monitor, its key selling point is it’s automatic device detection. The makers claim the high fidelity sensor combined with some super advanced machine learning algorithms will give it the ability to give you the lowdown of the key appliances in your home. The people behind Sense are the same people who ran Vlingo. Vlingo was a speech recognition software company that was behind early incarnations of Siri. Vlingo was acquired by Nuance Communications in 2011. Since then, the people behind Vlingo have put their weight behind Sense. They reason that voice recognition bears a lot of similarities with appliance recognition. I really like the fact that the Sense energy monitor can be installed directly inside your breaker box. Less devices inside the house means less clogging up of power outlets and / or ethernet ports. As someone who lives in an older place that doesn’t have many power outlets, I really appreciate this. Installation is rather straight forward however you will need to enlist the help of an electrician if you are at all nervous bout opening up the breaker box. Don’t forget that parts remain live, even if you have switched off all electricity. Sense provides a handy installation booklet. It walks you through step by step with clear diagrams. Basically, you just need to attach the voltage wires to an empty breaker (if you have one), clamp the current sensors around the main wires, make sure the antenna is outside the breaker box and connect everything to the sensor. Both the monitor and the current sensors are a bit bulky and you might have trouble fitting them inside your breaker box. Sense does provide a mounting kit so that you can install the monitor externally but I would have preferred it if it was a bit smaller. I find it disappointing that there is no web interface. Smart phone apps are great and all but sometimes it’s nice to see everything laid out on a proper monitor. Having said that, if you use the app, you might get a feel for why they’ve taken this route. The app feels like something that was designed to be a touch screen app from the ground up. The app for some of the other energy monitors out there feel very much like a port of the website. This is not the case here, it supports touch gestures and should feel very intuitive for regular smart phone users. All your data is encrypted by the monitor and sent to the Sense servers. I am glad to see that Sense has taken security seriously. Last year hacked internet connected devices were used to launch a huge DDOS attack. Even more worrying, streams from baby monitors and security cameras have been broadcast live to the internet for anyone to see. The Sense home energy monitor uses 128 bit AES encryption. This doesn’t your data impervious though. I highly recommend that you use a strong password and one that you have never used before. Security is especially important for a device that measure individual appliances. There’s a lot of information there about your every day life. When you open your Sense app, you are greeted with the Now screen. This essentially gives you a real time readout of how much electricity you are currently using. A graph runs along the top showing recent usage. Below that you’ll find a read out of the number of watts you are currently using and how much it’s costing you. If you have the solar kit, the graph will also show how much you are generating. It will appear as solid orange on the graph and the number of watts and the money being made under it on the left. The graph responds very intuitively to touch gestures. You can pinch zoom along both axis and swipe to scroll back in time. I think this is a fantastic feature because it makes it incredibly easy to see the information you want. The maximum level is marked at the top but there no other markings along the y axis. This would usually bother me but combined with the pinch zoom feature, it’s actually not a big deal. The number changes as you zoom so it’s possible to zoom to just the level you need to get an accurate reading. You can switch the graph for a bubble view. The bubble view is great for getting an intuitive sense for how much electricity each appliance is using (the ones that Sense can detect anyway). The bubbles grow in proportion to how much electricity the appliance is consuming. If you scroll down, you can see a list of detected devices and when they were in use. If you tap on one of the devices, you can get more information about it’s historical energy usage. Just a note on the cost calculator. It is a very new feature. As yet, it doesn’t have all the features you might expect it to have. The main issue is that it currently only lets you input one value for the electricity cost. If your provider has different pricing tiers depending on time of use, you won’t see this reflected here or anywhere else in the app. The usage screen gives you a bar graph of how much electricity you have used over a certain period. You can choose that period to be the last day, month week or billing period. Tapping a bar will give you the stats for that bar. Below that you’ll find the individual devices and the percentage of electricity they have used. You can tap on one and see the bar graph for that device overlaid on the on top of the overall graph, a nice touch. You can access the current usage graph which is the same as the one from the Now screen. This one you can make full screen for an even more detailed view. Question for the developers: why is the full screen version of this graph accessed from a completely different screen to the half screen version? For all the effort you have put in to make an intuitive interface, this seems completely illogical to me. One thing distinctly absent from this screen is some sort of estimate of how much the bill is likely to cost based on current usage. This was a really useful feature of the Neurio and I definitely miss it here. The devices screen shows you all the devices that Sense has detected. If you click on a device, you’ll see a whole range of stats on it. It tells you how much electricity and an estimated cost for the month. Once again, it would be much more useful to see the usage for this billing period here. One very handy feature is the ability to have the app alert you if a device has been left on for a certain amount of time. If your daughter left her hair straightener on, you’ll get an alert before it’s too late and everyone’s left. Submit an incident report about a problem in your home, and a member of our data science team will investigate the malfunction and share their findings with you. As we gather data about incidents, Sense will begin to detect certain types of malfunctions automatically. Your mileage may vary on how useful this is to you. What this does illustrate, however, is that Sense is very proactive in interacting with the community. They interact with users on their message boards too. App updates are frequent and do provide improvements that people have been asking for. What this means that if a feature that you want is missing, there’s a good chance the developers will incorporate it in future updates. One feature to come out of the HomeCheck service is the ability to detect faults with solar systems. Anything that prevents your solar panels from working to their full potential could make the difference of hundreds of dollars per year. In fact this one feature could make the monitor worth the money all by itself. At the time of writing, Sense offers one IFTTT trigger. This is “Device turned on/off”. If your Sense monitor has done a good job of picking up your appliances, this is really handy. You could turn your Philips Hue lights on when the garage door is opened. You could receive an alert when your washing is done. This feature essentially turns the ‘dumb’ appliances in your home into smart devices. As I’ll get into in the next section, the appliance detection is not without its issues. This being the case, I wish there were triggers available that made use of your overall energy usage. Being able to set a warning when energy usage goes above a certain for example level would be super handy. The developers at Sense claim to have put a lot of research into working out Alexa commands that are actually useful. You have to prefix everything with “Alexa, ask sense…”. For instance, if you want to find out your current energy usage, you would say “Alexa, ask Sense how much energy I’m using”. You can also inquire about specific devices, for instance “Alexa, ask Sense if my washing is done”. As a whole home energy monitor, the Sense does a stellar job. It measures voltage and power factor as well as current. This means that the results should be within a few kilowatt hours (kWh) of your actual bill. If you have solar, than this you’ll find that the Sense energy monitor tracks very closely with the readout from the inverter. Changes in electricity should update in the app almost instantaneously. On paper, the Sense boasts the most advanced appliance detection I have ever come across. Current measured millions of times per second. Machine learning to make sense of your data. It collates anonymized data from every other Sense user to continuously improve it’s algorithms. The founders have a background in voice recognition and are experts in pattern analysis. So how does it function in real life usage? Well, unfortunately, at it’s current stage, it’s just a little bit lackluster. The first problem is just how long it takes. Unlike the Neurio, you can’t just walk around the house training the app. It needs to learn it all by itself. The algorithms needs to see the same device many times before it can positively identify it. The website says this should take a few weeks but the reality is that you might not see a particular device show up for many months if at all. If your device does show up, it may just show one component of it (for example, one of the hotplates on your hob). If you move your appliance to a different phase, there’s a good chance it won’t register as the same thing. This can be a problem for devices like vacuum cleaners that you use in separate rooms. Sadly the algorithms just haven’t yet reached a point yet where they can positively identify every electrical device in your home. The good news is that once one of your appliances has been detected, it will to do a good job of locking on. The long learning period is used to make sure that it can identify the device in all sorts of different conditions. Once it’s identified, the app won’t get confused when lots of devices are on or when you turn a lot of them on at the same time (like the Neurio). Sense are really trying to push the appliance detection functionality. You’ll find your appliances listed on every screen of the app. The IFTTT integration is geared solely around appliances. Their promotional material really pushes this feature. You would think it would be solid then, right? Unfortunately this doesn’t seem to be the case. I don’t blame them though. A typical household has dozens of electrical appliances, many of them with multiple components. Detecting them all with just two sensors must be an absolutely herculean task! In fact there are no energy monitors out there that can do this well. Appliance detection aside, this is a very capable device. If your main goal is whole home energy monitoring, this will do an excellent job.